Ayres Composite Panels manufacture lightweight and high fire resistant panel technology suited to the interior fitouts for high performance marine vessels. With several different types of panel types and finishes they utilise various machines as part of their manufacturing process that are high users of electricity. appropriate solar solution to reduce their reliance upon the grid and therefore reduce their energy costs. 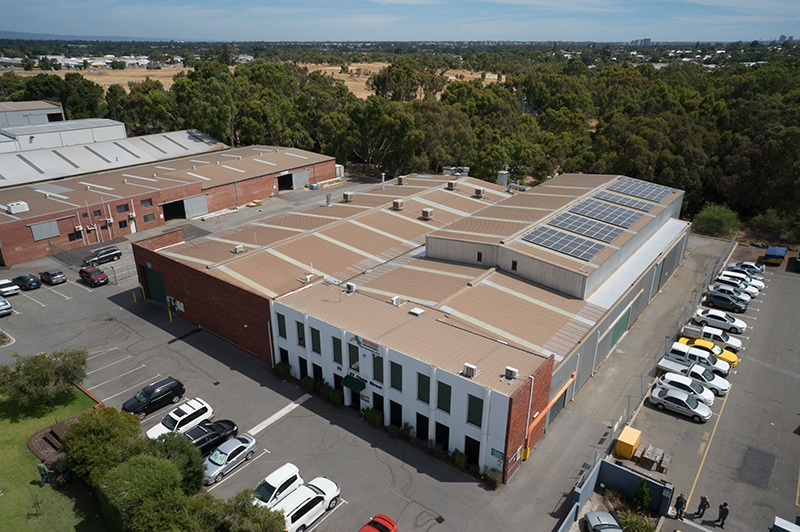 Although their roof space would accommodate up to 80kW of solar, given the Western Power rules relating to systems with inverter capacity over 30kW and the cost of the equipment at the time, it was decided that a 30kW system represented the best value proposition and would still deliver a significant portion of their electrical load. Being a quality endorsed and highly respected company themselves, Ayres Composite Panels were looking for a solar company they could trust to deliver a high quality system and be available post sale if they ever needed any assistance. Solargain were chosen as the supplier for these reasons. “We have now completed a full 12 months with our 30kW solar installation. The payback period, allowing for depreciation, is working out at 3.6 years – which is very pleasing. In fact the projected payback time is getting shorter each time we receive a bill; because what we are charged per unit of electricity has increased about 30% during 2013, which increases the $ savings." "Since installation I think we have saved approx. $16,500 (installation cost was $60,000)." It is great to have such feedback and hear from customers that are benefiting from their systems, as well as Solargain benefiting from referrals they give us to assist their business associates, family and friends. “We have now completed a full 12 months with our 30kW solar installation. The payback period, allowing for depreciation, is working out at 3.6 years – which is very pleasing.